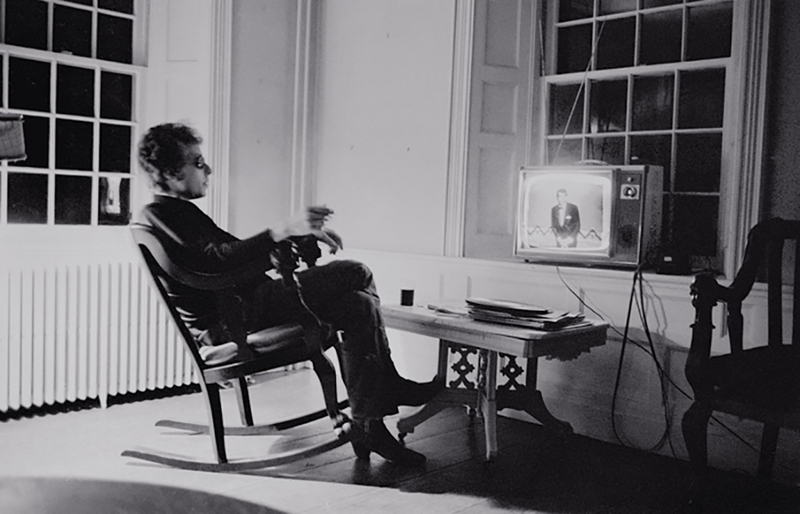 Bob Dylan watches Dean Martin, at home in Woodstock, Summer ’64, from a great set of photos by Douglas Gilbert. “In July of 1964, one year before his music changed from acoustic to electric, I photographed Bob Dylan for LOOK magazine. I spent time with him at his home in Woodstock, New York, in Greenwich Village, and at the Newport Folk Festival. The story was never published. After reviewing the proposed layout, the editors declared Dylan to be “too scruffy for a family magazine” and killed the story.” [Thanks, Bob G]. Yes, we all laughed when Peter Bradshaw sent Grace of Monaco up at the Cannes Film Festival. “It is a film so awe-inspiringly wooden that it is basically a fire-risk. The cringe-factor is ionospherically high. A fleet of ambulances may have to be stationed outside the Palais to take tuxed audiences to hospital afterwards to have their toes uncurled under general anaesthetic”. And it’s a very funny review, but having actually seen Diana, with Naomi Watts, a film he uses as an unfavorable comparison, I have to disagree about his heirarchy. Grace may be an undemanding watch, but it’s nicely shot and has a great cast of dependables (Langella, Jacobi, Parker Posey, and Kidman herself). Yes, the plot is nothing (rich people trying to keep their gilded colony afloat), but it actually looks like The Magnificent Ambersons in comparison to Diana. Maybe the music is somehow to blame – Christopher Gunning’s score sounds like Hollywood-orchestra-by-the-yard stuff, and it doesn’t suit the rather cool shooting style of the film, and, at times, drags it into near-melodrama. And you come across the radar of a lot of other people trying to crowdfund muso documentaries. “Hey, My name is Steve Duddy and I’m the executive producer of a brand new documentary titled Porcaro: A Band Of Brothers. The Porcaro family is one of the most prolific and iconic families in music. Jeff, Mike, Steve and Joe Porcaro helped shape pop and rock music as we know it today.” All true, but I’m just not convinced there’s a two-hour documentary in it. “Billie was part of my life growing up on a council estate in Newcastle. My father was obsessed with her and her one-time accompanist, Teddy Wilson. There were two LPs that became central to my understanding of Billie. One was The Billie Holiday Memorial, on Verve records. In her book, Blackburn describes hearing Billie for the first time, while listening to this album. The first track is “I Cried for You” and has Johnny Hodges on alto sax introducing the song. The LP was a compilation of some of her finest tracks and ended with her devastatingly sad version of “For All We Know We May Never Meet Again”. I know every track by heart, every click and each moment where the needle would stick. Blackburn seems to have had the same experience. When I first started collecting albums myself it was difficult to find any I could afford that my dad didn’t already own, so I would look at cheap editions of LPs. Most were not so good, but I did find one that my dad didn’t have. One of the tracks was “Fine and Mellow”, and I later learned that it was taken from a TV show called The Sound of Jazz. It is my favourite Billie track of all time and I know every note by heart. She is accompanied by Ben Webster, Lester Young, Coleman Hawkins, Gerry Mulligan and Roy Eldridge. Blackburn talks about this track in her book, but I would like to add a different slant. Years after first encountering the LP, I saw a documentary about Billie which included the complete TV footage of “Fine and Mellow”. It was the most profound experience to see how the music was animated: the way the musicians and Billie interacted with each other, the way she moved her head when Young was playing his solo. I’d go as far as to say it is my favourite piece of film of all time. There is no other jazz footage I am aware of that comes even close to this in describing the beauty of jazz improvisation.” Wonderful. On Woman’s Hour, Rebecca Ferguson does a fine version of “Don’t Explain” – she doesn’t overly over-soul [or should that be over-jazz?] and there’s a lovely grain to her voice – hear the way she sings “You are my joy… and you are my pain”. It’s remarkable to hear her speak in a quiet, almost dour Liverpool accent, then sing like this. This wonderful remincence of Muddy Waters by John Moore, on The Guardian’s music blog: “A couple of weeks into guitar lessons with a lovely schoolteacher called Jill, who had written a song for Rags, the Blue Peter Horse that was broadcast on BBC1, I was able to play “Oh Where, Oh Where Has My Little Dog Gone?” – a sad lament to a lost pooch. As I strummed it for Peter, hopefully, I felt sure it would earn his approval. It didn’t. He was polite enough, of course, but as my parents beamed with pride at their six-string wunderkind, he asked if this was really the kind of thing I wanted to play. Come to think of it, no, I replied. Then the suburban epiphany began, and the devil’s music came to Wokingham. The man in the sharp suit, with the cigarette glowing in the side of his mouth, picked up my guitar and began to play. The words, and sheer brutality of the riff, almost broke me in two. And that’s when it started, year zero: from teenybopper to bluesman in one evening. As far as I was concerned, the little dog could stay lost, all I wanted was a John the Conqueroo, and a black cat bone – which, with our own midnight black, ancient moggy, was a distinct possibility. That Sharon Robinson, great Leonard Cohen collaborator, is not a front person; some people work best in the engine room. Coming into the front room that is west London’s Bush Hall, we’re treated to the kind of performance that requires ‘notes’ – from a musical director, promoter or friend, whoever will say: “Don’t play that song, rehearse that one some more, don’t cover the electronic keyboard with a shawl that makes it look like she’s trying to reach the dead, do away with the pre-recorded drum tracks that bring John Shuttleworth to mind and hire a percussionist instead, don’t be exposed up there while your son doesn’t really cut the mustard as accompanist, with erratic timing and lack of articulation…” The trumpet player was great, but there needed to be more sonic variation. Also, if Leonard’s songs take up fifty percent of your set, you really need to tell illuminating anecdotes of your time working with one of music’s finest and most interesting lyricists. Something about the working relationship, with a sense of detail that will make an audience feel special. 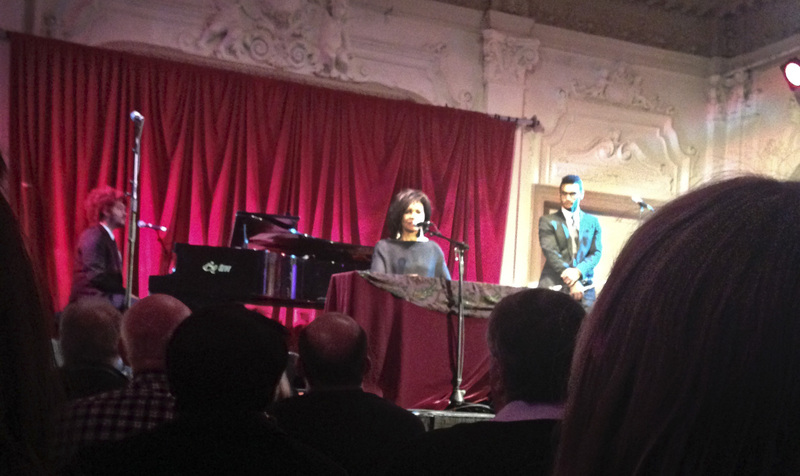 Sharon Robinson has a wonderful voice, and sings with conviction but lacks the killer instinct of the true performer. It was not unenjoyable (in fact we may have been the only people to not love it – the audience were pretty ecstatic) but it would have been so much better with a great rhythm section at an intimate club like Ronnie’s. In a week of such nostalgia (not even mentioning Linda Grant’s lightly cringe-inducing piece on the potential passing of Joni Mitchell by, in effect, saying “You may be saddened by Joni dying, but I will be the most saddened person ever. I will, I promise – the most saddened person in the whole of the world. She wrote my life – did I tell you how sad I’d feel?”) here’s hoping next week’s blog will be a little more forward looking.